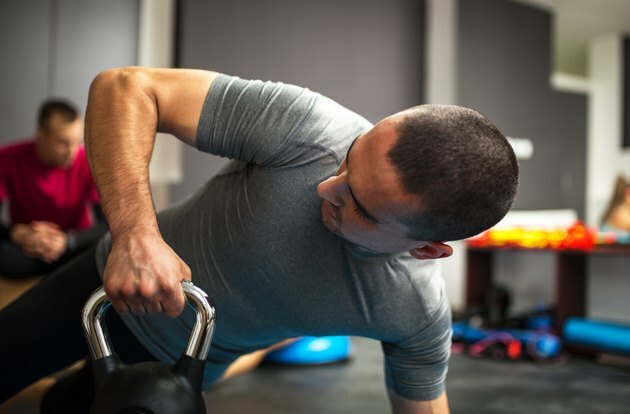 What Are the Different Types of Circuit Training? Circuit training involves moving from one exercise to another in quick succession. A circuit typically consists of five to 10 exercises performed for 30 to 90 seconds each. You can create a circuit to meet almost any exercise goal. A circuit training workout helps you expedite your workout and builds endurance because it leaves no time for rest between exercises. While a circuit might include any one of hundreds of exercises, the workouts fall into several specific categories. A strength circuit consists of weight-bearing, strength-focused exercises. You may perform a strength circuit using body-weight exercises, free-weight exercises or machine-based exercises. A combination of all of these modes of strength training could also be part of a strength circuit. You can make your cardiovascular workout more interesting by performing a cardio circuit. A cardio circuit might include a quick succession of moves such as jumping jacks, speed skaters, jump squats, burpees and jumping rope. Another alternative is to perform a circuit by visiting five or more different cardio machines – doing a short burst on each to raise your heart rate. For example, warm up on the treadmill and then sprint for two minutes. Immediately move to the step mill and step up at a rapid pace for two minutes. Jump on the stationary bike and pedal up a very steep hill for two minutes. Move to the elliptical and hit your stride speed as fast as possible for another two minutes. Finish the circuit with two minutes of intense rowing on the rowing ergometer. Complete this circuit two to three times for a complete 20- to 30-minute routine. A circuit combining strength-training moves with cardio can burn up to 10 calories per minute, according to "Fitness" magazine. In this type of circuit, a strength training move -- such as squats -- is immediately followed by a cardio move -- such as sprinting the length of a basketball court, followed by another strength move such as pushups. This circuit can be a total body workout, by including a strength move for each of the major muscle groups. A sport-specific circuit would be designed for athletes looking to improve their performance in a particular sport. For example, a running circuit might include leg and core strengthening exercisers interspersed among half-mile race pace runs on the treadmill. Other sport-specific circuits include kickboxing circuits -- alternating core, shoulder and gluteal strength-moves with punching and kicking segments -- and football circuits -- alternating agility drills with weight training. How Many Calories Does One Hour of High Intensity Circuit Training Burn?